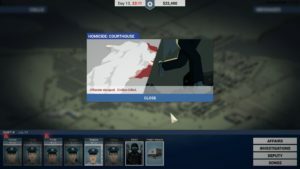 A new release on Steam, This Is the Police gives gamers a chance to be the police in the corrupt crime stricken city of Freeburg. With an impressive mix of good story and strategy This Is the Police puts the player in the shoes of Freeburg’s retiring Police Chief Jack Boyd. The main protagonist in the story is Jack Boyd. Here Jack is prepares to give a news conference on his retirement as Freeburg’s police chief. 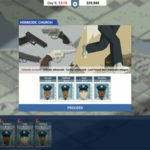 With 180 days to retirement, Jack’s primary goal is to acquire half a million dollars between now and then, while still performing the duties of a police chief. 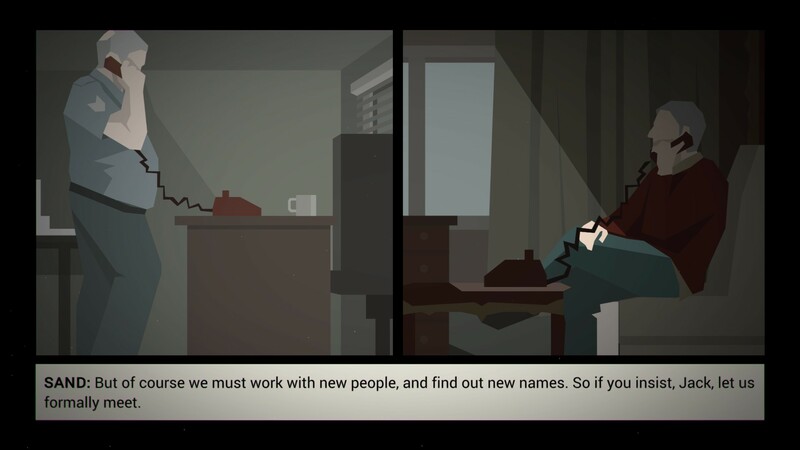 Full of intrigue, scandal, and corruption, this dark and gritty tale is played out through the choices the player makes. Does Jack stay true to the ideals of a highly respected member of the Police and a Police Chief, or fall to the dark side of the city and the mafia. 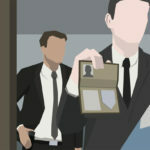 During the course of the game Jack must contend with city hall, the mafia and his colleagues. Though Jack’s story highlights the game, the guts of This Is the Police is the role of police chief and managing Freeburg’s finest. The player assumes the role of police chief in charge of Freeburg’s finest. Shift A officers about to start the day. The story goes by days. Each day starts with either Jack narrating or goes directly to Police headquarters. There are two shifts, A and B, depending on the day it could be either one. It is the role of the player to send officers out on calls that come throughout the day. 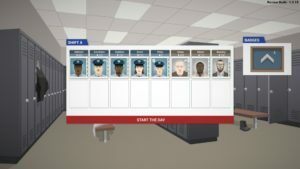 Players assign officers to the calls based on strength. Sending the wrong officer out could lead to the offender escaping or and officer or civilian killed. 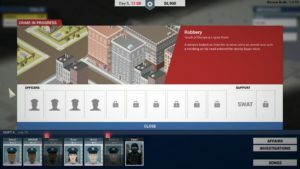 Calls are designed to mimic real life situations, such as homicides, thefts, robberies, assaults, suspicious packages, etc. 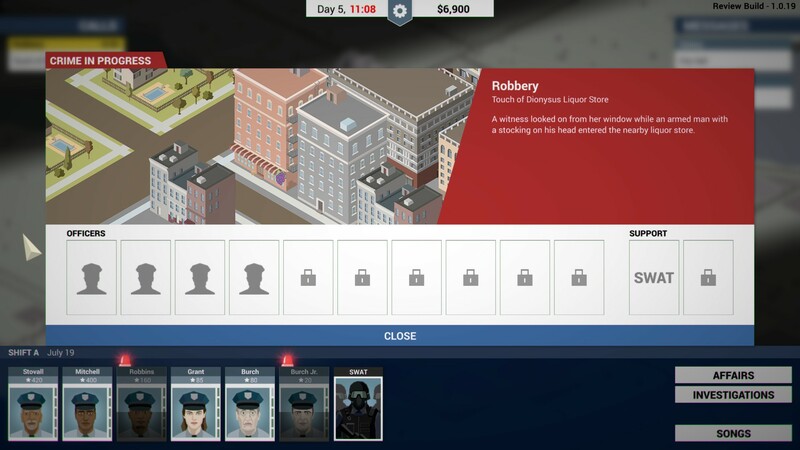 Most of the game the player sends out officers on calls. The city of Freeburg and officers responding to calls. 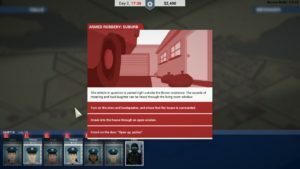 Each officer gains points or losses points depending on the outcome. If the offender is caught and both officers and civilians are unharmed points are rewarded. However, if the wrong officers are sent, or not enough officers are sent an officer, civilian, or both could be killed or the offender just escapes. The key to the game is to bring everyone back unharmed and look out for the safety of the citizens of Freeburg. The game does throw in some odd jobs such as act as a bouncer, participate in a festival, or guard a movie theater. These can bring in cash. The city of Freeburg has an opening for a crooked police chief. Apply today with a code from Amazon! Throughout the day officers are sent to calls. 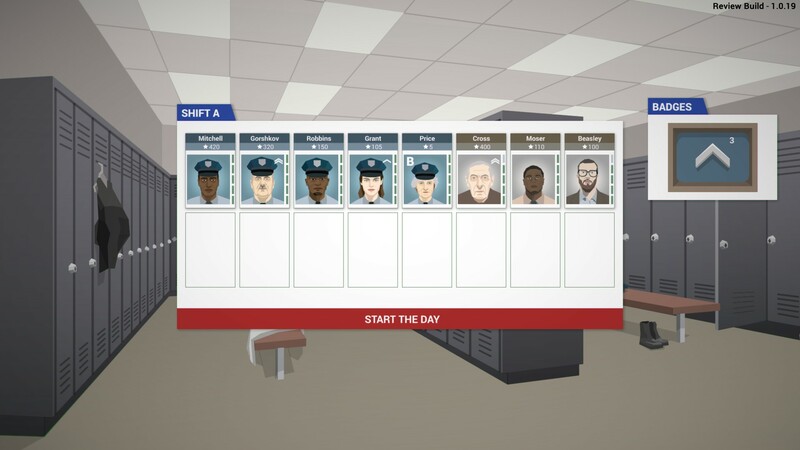 Player must choose which officer is assigned to which call according to their strengths. 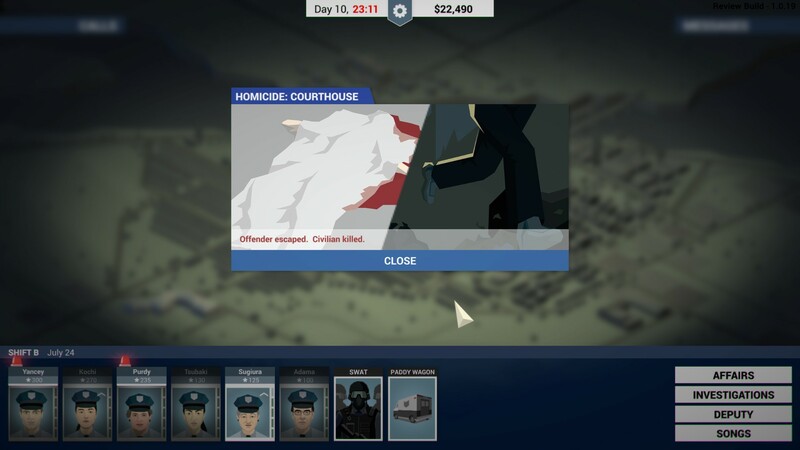 Other routine business occurs in the game, such as hiring new officers or firing under performing ones. 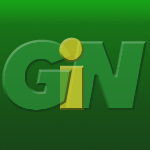 Making requests for City hall is available with one request per seven days. City hall will also come with requests for the Freeburg PD. Refusing requests can strain relations. 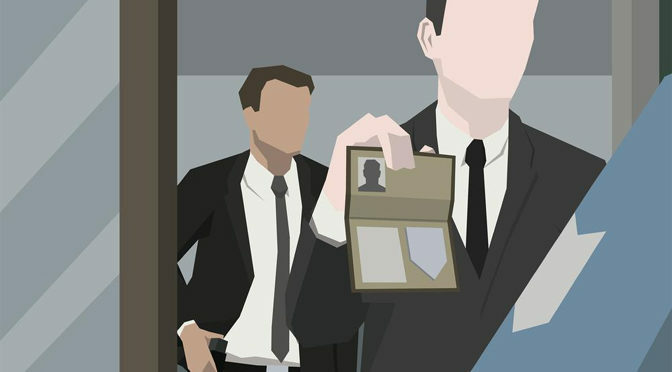 What is a police force without detectives? 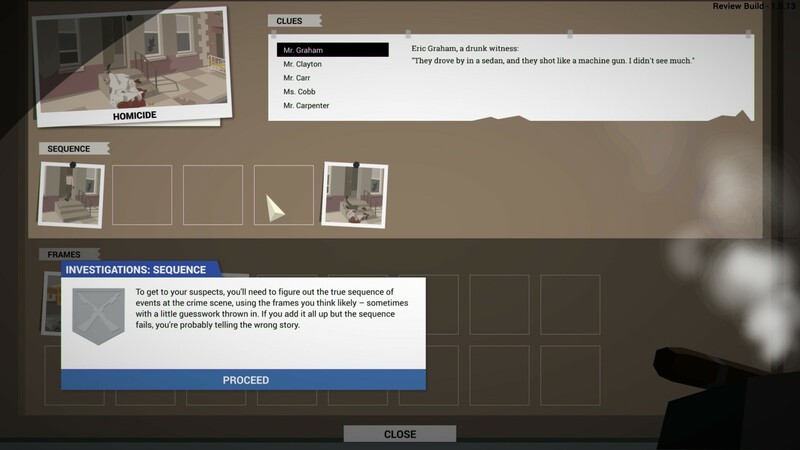 The game has them and players get to make choices regarding investigations. I didn’t particularly find the investigations that exciting. They mainly happen in the background and there is not much player involvement, except for putting frames in the right order. They also seem to go on for a long time. Freeburg has detectives and investigations are ongoing. 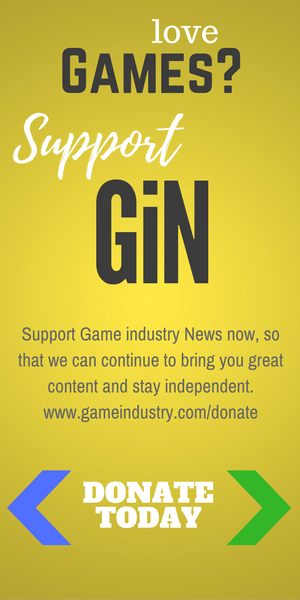 Some of the crimes ask for player involvement. 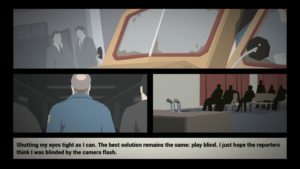 Given choices players chose which scenario is the best option for the situation. Choose the wrong option and harm can come to civilians or officers. Its up to the player, some options ask to shoot the suspect or just tease him. Talk them down or go in full force. Sometimes backup is required. If no one is on call, that’s when ordering an officer retreat becomes a viable option. Always have an officer on call and hire more police. In This Is the Police players can make choices to how an officer tackles a crime. 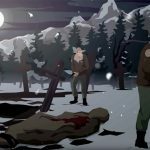 What makes this game good, besides the intriguing and engaging story is the ambiguity of the game. Freeburg can be any city in the world. Even the time period is not explicitly stated. At first I thought today but then some elements hark back to the fifties or late seventies. It’s really what the player wants it to be. The art too is ambiguous, simple styling that captures the heart of the story well. Some animation is included and the game is fully voiced. The game has a simplistic design but with well developed characters and voice acting. Jack Boyd talking with Christopher Sand of Freeburg’s mafia. Out of all the elements in this game one thing stood out the most, the voice acting. I was blown away by the perfect narration of Jack Boyd. He truly sounded like a Police Chief that has been around too long with lots of baggage. All actors where incredible, and fit their roles perfectly. 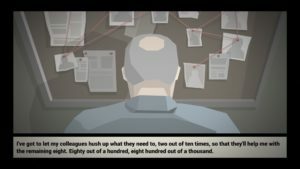 Even the mafia leader Christopher Sand fit nicely into the Freeburg crime world. Not your typical mafia guy, he sounded like an average person off the street, kind of homely which gave a very sinister appeal to his character. About the actor portraying Jack Boyd, its Duke Nukem Jon St. John. Terrific voice acting for a game. Not all choices turn out well. What is a game without music? Here the player chooses their soundtrack to start the day and throughout the long hours on duty. There are not many choices of music. Available is jazz, classical, and old time songs. The records are played on a record player. 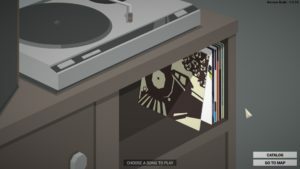 I would have liked more music choices, though players can purchase new music during the game. Players choose a song to keep motivated on the beat. This game is worth playing for many reasons. Two reasons would be great story and being the police. This is not a Law and Order, CSI game, players choose how the police respond to situations and outcome of events. Officers and civilians are put into harm, take care of them or Jack might end up taking dead officers salary for retirement. You also get SWAT, just not always available when needed. The police force is diverse with male and female cops, young and old, and all ethnic groups. Some of the excuses for time off are amusing. “No, I am not going to let you take off to finish a novel.” “I forgot to feed my fish” seems like everyone has that excuse. This game is on the choices made for the Freeburg police and Jack Boyd a retiring police chief. 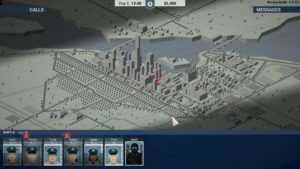 This Is the police is perfect for gamers who want a gritty story of intrigue and corruption that has real world police action. A strategy game built around power, crime, greed, and law and order.